While it was by no means ever a military institution, Elon played an important role in conjunction with the U.S. Army during World War II. By the fall semester following the Japanese bombing of Pearl Harbor, around 200 Elon students had been drafted into the armed forces, decreasing the total enrollment from 661 students in 1940-41 to around 475 students the following year. This reduction in the student population prompted then Elon president Dr. Leon E. Smith to make a push that the vacant space on campus be used to aid the war effort by providing training space for enlisted soldiers. Following extensive negotiations with the U.S. government, Elon was approved to house an Army Air Corps training center for men seeking commission in the Air Force. 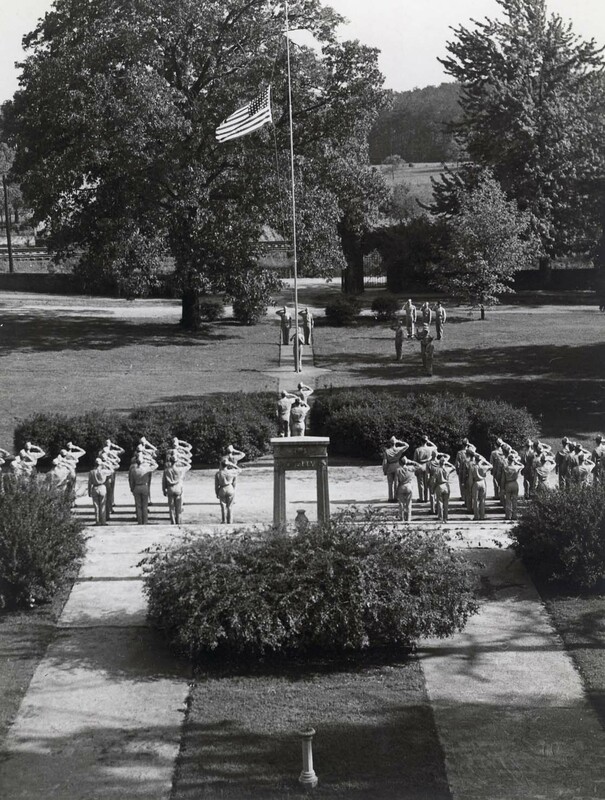 The first group of trainees arrived on campus in April of 1943, creating an interesting mix of military and civilian life on Elon’s campus. Students continued with their normal coursework, while Air Force trainees were instructed both militarily by their officers as well as academically by the Elon faculty. The east side of campus became the designated “Military Reservation” and was restricted to students, except on weekends, just as west campus remained purely academic. The military program also had an important effect on the religious life of students at Elon. The arrival of trainees from all across the nation brought in faiths other than Protestantism to the college. Services were held in the chapel of the Mooney Building for both Roman Catholics and Jews, probably marking the first time that services of non-Protestant denominations were held on Elon’s campus while creating a precedent of religious toleration that is enjoyed by all Elon students today. The Air Corps program continued at Elon until 1944, and by the end of the war 672 pilots had been trained for the Army Air Forces on Elon’s campus. Both the Army and the school benefited from the relationship, as Elon received a total of $166,263.40 in federal funding, helping to offset the lost revenue from 1943’s depleted student body. In the end, hosting the Air Force troops during the war allowed Elon to remain open to students while also playing an active role in winning World War II. This entry was posted in Campus services, National Events, Student Life. Bookmark the permalink.